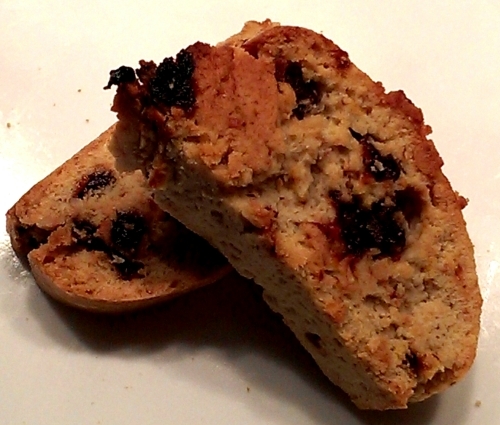 Cherry Biscotti, a variation on a classic Italian cookie recipe, incorporates dried cherries and walnuts with a touch of orange flavoring. These “twice-baked” cookies are a delicious version of this traditional favorite – ideal for dipping in coffee, espresso, tea, milk, or wine. Preheat oven to 350º F. Lightly grease a large baking sheet. In a medium bowl, combine flour, baking powder, baking soda, salt, and walnuts. Set aside. In a separate bowl, with an electric mixer on medium speed, beat together ¾ cup granulated sugar and 2 eggs, scraping the bowl constantly, until thick. Add oil, orange juice, orange eel, and vanilla extract. Beat 1 to 2 minutes until well mixed. Gradually stir in dry ingredients into dough, beating just until well blended, about 1 to 2 minutes. Dough will be thick and sticky. Turn out dough onto a lightly floured surface. Knead in cherries. Divide dough in half. Shape each portion of dough into a 8-inch by 2-inch loaves. Set both loaves on the prepared baking sheet, side by side, about 3 or 4 inches apart. Flatten tops slightly. Combine egg white and water. Brush on loaves. Sprinkle loaves with extra granulated sugar. Bake for 25-30 minutes until loaves are just set, light golden around the edges, and firm to the touch. Remove baking sheet from the oven. Allow loaves to cool on the baking sheet for 15 minutes. Reduce oven temperature to 300ºF. Transfer loaves to a cutting board. Use a serrated knife to cut loaves into ½-inch slices. Re-coat baking sheet with cooking spray. Place slices cut side down on baking sheet. Bake for 15-20 minutes until firm, turning once with a spatula. Remove baking sheet from the oven. Allow biscotti to sit for 5 minutes before using a spatula to transfer them to a wire rack. Cool completely. Store biscotti in an airtight container with waxed paper in between layers. Cherry Biscotti can keep well for up to 3 months when stored in an airtight container.